Dongzhi (冬至) or Winter Solstice festival is one of the most important celebrations for Chinese people. It falls on December 22 this year, which is tomorrow. I have never written about Dongzhi festival on Rasa Malaysia, but this year, I’ve decided to write a post about it, sharing my family’s tang yuan recipe, as a tribute to my late aunt who recently passed away. Last December, I was home in Penang. My son and I spent three months and celebrated Dongzhi (and then Chinese New Year) with my family. Little did I know those three months would be the last time I spent time with my aunt. My aunt, who passed away in October, had always been the ones tasked with all the celebrations and ceremonial rituals in our family, for as long as I could remember. She was the gate keeper for us, constantly reminded us and made sure that we observed the important festivities so ingrained in our culture. As a child, Dongzhi had always been a fun festival that I so looking forward to. The reason is simple: I love tang yuan, or sweet dumplings served in pandan leaf and ginger infused syrup. I have countless childhood memories when all of us—my aunt and cousins—would gather around in the kitchen area, helping my aunt rolling the dough into small round balls. As a young child, I absolutely loved and enjoyed playing with the dough balls. My aunt would make a big batch of white dough, then she would separate it into three different portions: plain white, pink, and yellow. She would start off by adding the red color powder into the white dough to make the pink dough, and then the yellow coloring to make the yellow dough. My cousins and I would then help to roll the dough balls into small, beautiful round balls. My aunt was so skillful as she could roll a few tang yuan at one time, and each of them would always come out beautiful and perfectly round. On the morning of Dongzhi, other than Tang Yuan, she would have plenty of dishes, specially made and prepared for prayers. All the foods would be served in traditional serveware (like the bowl and spoon pictured above) and as offerings to our ancestors. After the prayers, my big family would all gather around having a feast, savoring delicious tang yuan and the amazing array of foods prepared by her. You might also try my other sweet dumplings recipes: black sesame dumplings, red bean dumplings, peanut dumplings. Dongzhi (冬至) or Winter Solstice festival is one of the most important celebrations for Chinese. To prepare syrup, boil the water in a pot. Add the screwpine leaves and ginger and bring it to boil on medium heat until you smell and ginger and pandan leaves aroma. Add sugar and let it simmer for another 15 minutes minutes. Add more or reduce the sugar, to taste. Set aside. In a big bowl, mix glutinous flour with water and knead with hands to form a dough. The dough is done when it doesn't stick to your hands anymore. Divide the dough into 3 portions, with the plain dough the biggest portion. Add 2-3 drops of each food coloring to make the pink and yellow dough. Pinch the dough into small balls and roll them in between your palms into round balls. Set aside on a flat surface lined with paper or a slightly damp cloth. Boil another pot of water, drop the dumplings into the boiling water. As soon as they float, transfer them into the syrup water. Serve immediately. Adjust the water level to the flour. Add more water if the dough is too dry. Add more flour if it's too wet. I would like to commend the elders in your family who had/have passed on the recipes and culinary skills to you.Your recipes are sincere and easy to follow. I do cook and I am from Penang too so I am qualified to say that they are truly authentic and coming from your heart. I told my own daughters that they should refer to your recipes if they miss Malaysian food. i just finished with my tang yuan, thanks to you. the taste was good. but the color wasn’t so bright and the syrup wasn’t that clear either, unlike yours. any tips? I am so sorry to hear of your aunts passing but happy to hear of the traditions and memories she has left with you. I am an american who find great joy in learning and celebrating traditions from other cultures being that america does not have its own deep routed traditions. Thank you for sharing this recipe with us all. As I make this I will surly think of the memories you had of your aunt. Nice! I was just looking for a recipe because today is yuanxiao. Your pic looks amazing! Will go and buy pandan leaves tomorrow to try out your recipe… thanks! Thank you for sharing this simply and easy to follow recipe. 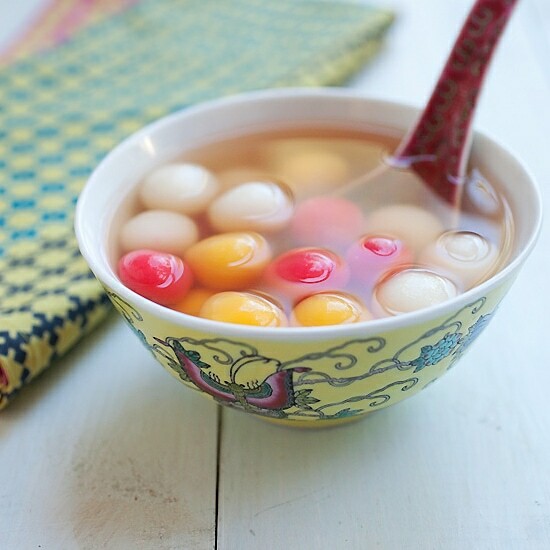 Have tried a few Tang Yuan recipe before, still not satisfied me. Definitely will try this. By the way, can I refrigerated cook in syrup Tang Yuan (sometimes I “accidentally” cook more), because the precious recipe I tried, the Tang Yuan become hard. Yes it will become hard but just warm up again and they will be fine. My dumplings can put super basic and not really good. I had this one time with a friend who married a Chinese lady and i remember it being delicious, mine not so much. Extremely bland, not sweet but the syrup was good bc I love ginger. Anyways is this how it’s suppose to be or am i not doing it right? Also i think i made my too big maybe a inch and a half bc they took forever to float. Maybe too big. The dumplings don’t have taste. The taste is in the syrup.